MP4Cam2AVI is MPEG4/MJPEG to AVI converter/joiner for MPEG-4 camcorders and digital photo cameras. It makes MPEG-4 camera clips DivX/XviD compatible and playable with any DVD-MPEG4 player like regular MPEG-4 movie. 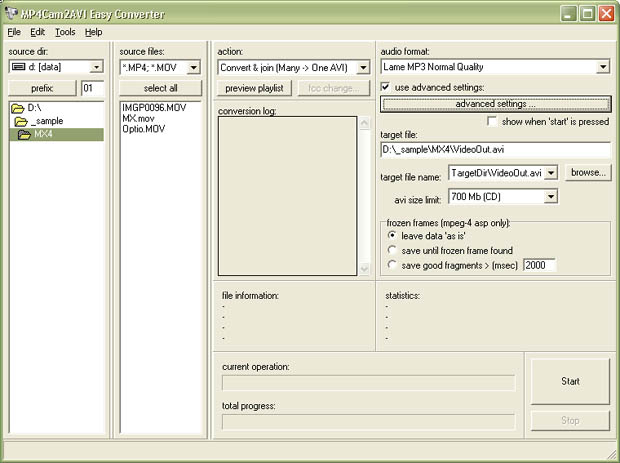 MP4Cam2AVI is MPEG4/MJPEG to AVI converter/joiner for MPEG-4 camcorders and digital photo cameras. It makes MPEG-4 camera clips DivX/XviD compatible and playable with any DVD-MPEG4 player like regular MPEG-4 movie. Program supports *.MP4, *.MOV, and *.AVI input (MPEG-4 AVI's from Casio P505/Z750 cameras are not DivX-compatible). MJPEG *.MOV's from photo cameras are supported as well. MP4Cam2AVI doesn't recompress video, that means no quality loss and fast operation (5-20x realtime, depending on audio settings). Audio can be stored in source format, or converted to MP3 (best for DVD-MPEG4 players) or PCM (best for editing).